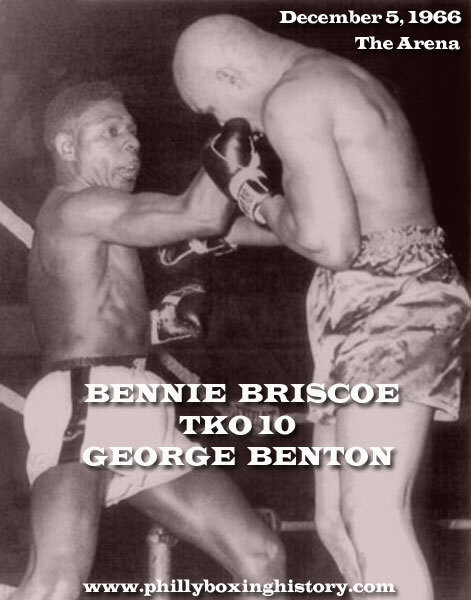 Former welterweight Bennie Briscoe made his middleweight debut in this bout for the Pennsylvania State Middleweight Title on this day in 1966. George Benton, once the top contender for the 160-pound division, showed signs of his brilliant defensive technique early in the fight and used effective jabs and hard right hands to build an early lead. But it was Briscoe's wrecking ball style that eventually won the day. Bennie pushed forward working Benton's body, slowly wearing him down. In the 9th round, Briscoe pinned Benton in the corner and pounded away for almost three minutes. The always tough and savvy Benton survived the onslaught but the end certainly seemed near. In his corner just before the 10th and final round, George's manager Herman Diamond stopped the fight despite the beaten fighter's protest. It was only one of two times Benton was stopped (the other time due to cuts) in his long career. For Briscoe it was the start of his great middleweight run. The following year, his draw with future Middleweight Champ Carlos Monzon at Luna Park in Buenos Aires, would solidify him as a legitimate title threat.